It’s a little strange returning to school after so long. Everything is going to be different. Your classes have changed. Maybe your circle of friends is expanding. Even you’ve probably changed quite a bit. But your room is still exactly the same as it was last semester. 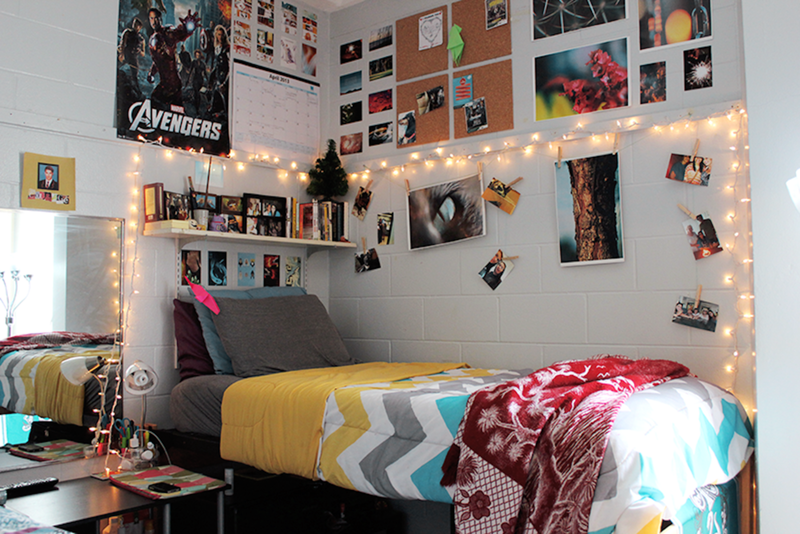 It’s time to refresh your dorm to suit the new you! For those out there who are completely bored with how their room looks, maybe you should consider rearranging your furniture. You could try moving your desk over to the window. This would give you better light to work by, and a new perspective that can help you approach whatever homework your classes throw your way. You could try switching your bed around to make more space. This will make an incredible difference in the layout of your room. Never underestimate how exciting just a little change can be. The walls of your room can either welcome you back home after a long day of classes, or they can make you feel like you’re in prison. If white walls aren’t really your cup of tea, maybe it’s time to cover them up. For more extensive coverage, you could hang up tapestries. There are tapestries of all kinds available online, but for those light on cash, Five Below has a few five dollar ones that look fantastic. Another great cheap option is to hang leftover wrapping paper, although maybe not the intensely Christmas themed ones, onto your walls. This will give your room a nice dose of color that can keep you from getting those winter blues. For walls that are already nicely decorated, maybe some things can be swapped out or moved around. Christmas lights can be exchanged for new strings of lights that glow beyond green and red. Old posters can be taken down to make room for new ones. If you’re artistic, you could try painting or drawing some new posters yourself. If you’ve discovered a new band or musician that you absolutely love, you could put up a poster of them. Your bedding can also provide a good portion of your room’s style. New sheets or a cute throw blanket could make all the difference in how your bed looks. With it being so dark and dreary outside, it might be nice to use brighter colors to decorate your room. Try steering clear of browns, dark blues and grays. Cheerful colors like yellow, pink and turquoise will work to be a nice contrast against the duller colors outside. Another way to make your room more cheery is to decorate for Valentine’s Day. Target has a large selection of heart shaped everything. They have plenty of cheesy banners and window clings that will really set the mood for the start of this semester. The best part of this idea is that once Feb. 15 hits, your room can be mixed up and adapted again. This way, it won’t get boring after a month. It’s never a good start to be bored with your living space on day one. Changing things up is sure to make this semester a little more interesting, and hopefully a lot more bearable. Rebecca Maher is a campus correspondent for The Daily Campus. She can be reached via email at rebecca.l.maher@uconn.edu.